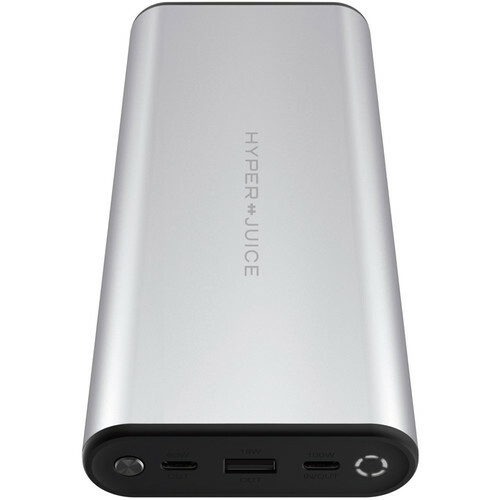 Use the silver 27,000mAh HyperJuice USB Type-C Power Delivery 3.0 Battery from Sanho to keep your MacBook, MacBook Pro, MacBook Air, iPad, iPhone or USB-powered devices charged and ready to go. This rechargeable external battery has a protective aluminum and ABS plastic enclosure that ensures it's built to last. Moreover, it features two USB Type-C ports, one of which outputs 60W and the other outputs 100W while a single USB Type-A port that outputs 18W. These ports also support Power Delivery 3.0 and Qualcomm Quick Charge 3.0. The HyperJuice provides a maximum power output of 130W and a maximum power input of 100W. It can be fully recharged within 1.5 hours. Furthermore, this portable battery is built with integrated over current, voltage, temperature, and short circuit protections.